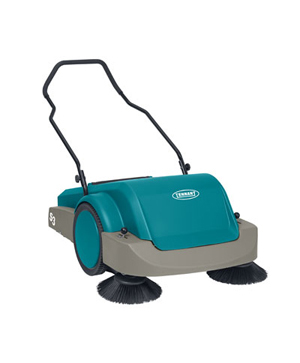 Clean large indoor and outdoor areas quickly and effortlessly with dual side brushes and self-propelled operation. Quiet 62 dBA sound level and maintenance-free batteries make cleaning safe, anytime, anywhere. The S9’s durable roto-mold design is backed by a 10-year TennantTrue® Warranty. 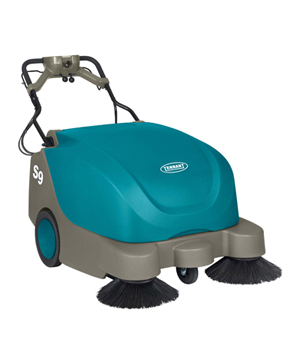 Dual side brushes and intuitive design make the S3 perfect for both indoor and outdoor cleaning. 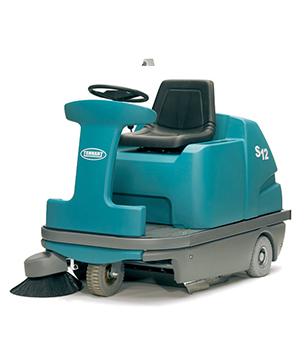 Manual operation makes it a great sweeper for quietly cleaning noise sensitive environments. Tennant’s S20 compact mid-sized rider floor sweeper is a heavy duty machine that maneuvers easily in tight spaces with the sweeping performance of a mid-size sweeper. 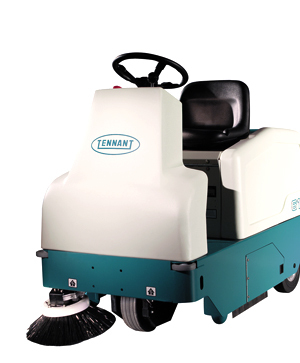 Tennant’s 6100 sub-compact rider sweeper is a maneuverable battery-powered ride-on sweeper that quietly captures dust and debris in a single pass. 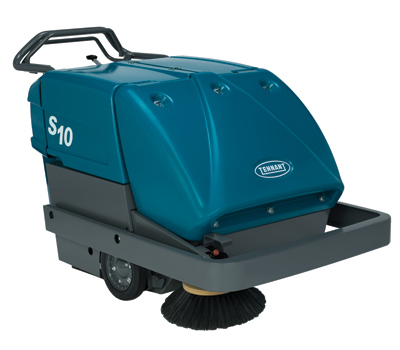 Tennant’s 800 Industrial Rider Sweeper features a wide cleaning path and large capacity hopper to capture everything from cement dust to heavy debris. 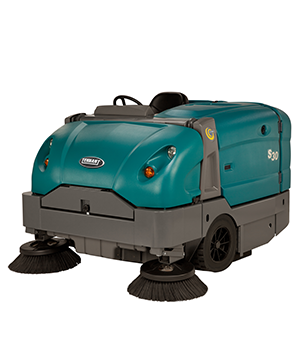 Tennant is one of the world’s number one names in the industrial cleaning equipment industry, and Goscor is proud to offer an extensive range of sweepers from this world class manufacturer. 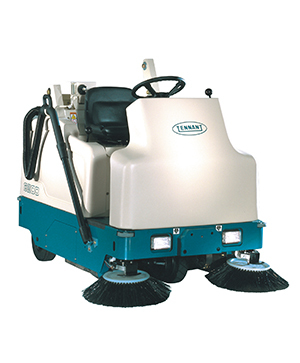 Tennant provides robust and reliable sweepers suited for a range of applications both indoors and outdoors. 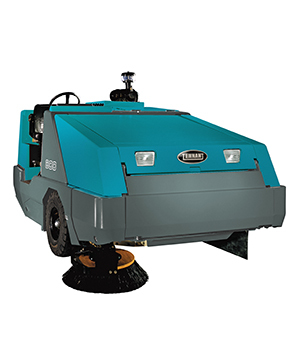 Each Tennant sweeper provided by Goscor is designed with patented cleaning technologies to provide the most effective cleaning solutions from the smallest areas to the largest. The sweepers get the job done with optimal dust control features built in, so that you don’t end up with a second mess to clean up when you’re done sweeping or risk facing harmful respiratory issues. Try the Tennant rider floor sweepers to maximize your cleaning inside and take advantage of their heavy duty battery powered industrial floor sweepers to meet the biggest, toughest sweeping jobs head on. Whether you’re working in industrial, mining, retail, or outdoors, Goscor has the perfect Tennant sweeper for you. Choose from nine different models in the range, from push sweepers to large-scale riding sweepers, and enclosed or open-top street and parking lot sweepers. 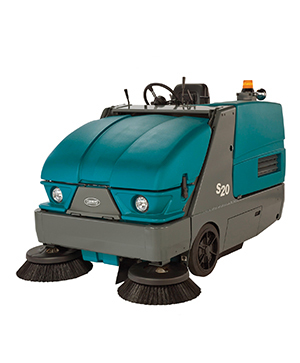 Buff the floors or clean the streets with the Tennant S9 – 7200m2, the S3 – 2500m2 dual brush sweeper, or the 3268m2. Hop on for a ride outside with the Tennant S12 – 3600m2, 6100 – 3800 m2, 6200 – 6420m2 and S20 – 7620m2 dual brush ride-on sweepers, and the S30 – 9540m2 and 800 – 10 050m2 street and parking lot sweepers. Choose Goscor cleaning equipment for products and services that you can trust. Goscor has been in the business for more than three decades, providing a combination of world class products, innovative solutions and professional support to every customer. Goscor provides a wide range of equipment from some of the best names in the industry, and the friendly and experienced professionals at Goscor understand each of their customers’ needs and expectations.